IT HAS BEEN 25 YEARS SINCE NAPOLI last won the Scudetto as champions of Italy – and in that time the myth around their title win has grown. While it is undeniable that the mercurial talents of Diego Maradona played a large part in the win, the contribution of the defensive unit is often overlooked, with the rugged Ciro Ferrara starring at the back. 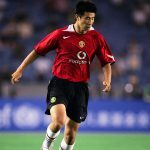 This strange juxtaposition between skilful exuberance and defensive pragmatism can also be applied to Naples as a city; it has produced attacking players like Gianfranco Zola, Antonio Di Natale and Vincenzo Montella, but there is also a certain degree of pride that defensive players like Fabio and Paolo Cannavaro and the aforementioned Ferrara were born there. To harness the fanatical support in Naples the club needs the right coach, a coach who understands the need to balance the two faces of the city and the passion that the people of Naples have for their football team. It appears that they may have finally found that coach in Maurizio Sarri. When Sarri took over the role of Napoli coach before the start of the season there was an element of doubt surrounding the appointment. Here was a coach who had spent the previous three years with modest Empoli between Serie B and Serie A, and who had spent the rest of his coaching career at provincial lower league sides. Now he was expected to cope with the pressure at one of the biggest clubs in Italy. He has one thing, however, that gave him an edge before he had even begun his first press conference: he is a son of Naples himself and fully understands the complicated dynamics of the city and the club. When Sarri took charge he was asked whether he would look to strengthen what had been a relatively porous defence in the transfer market, but simply responded that any defensive issues could be corrected with good coaching and work on the training field. To back this up, Sarri took with him from Empoli his method of training whilst filming via an overhead drone to record the session for later analysis. This training tool was credited with helping to make Empoli’s defence one of the strongest in Serie A; at Napoli he will spend time with each individual player, showing them where slight positional adjustments can help to improve the defensive structure as a whole. In 12 games so far this season Napoli have conceded just eight goals, a defensive record that Is bettered only by Internazionale so far and which is vastly better than their defensive statistics from the previous two seasons under Rafa Benítez. While watching and analysing Napoli under Sarri this season there are certain elements of play that stand out and highlight just why they have been so impressive tactically to this point. Firstly, the defensive structure is highly impressive, with the back four moving very much as a solid unit and the three central midfielders offering a further defensive screen just in front. When an attack for Napoli breaks down there tends to be a split in the central midfield area with one player, usually Marek Hamšík, having advanced to support the attack and the other two players shifting across to create a double pivot that offers both an extremely effective base to negate opposition counter attacks but also an ability to shift and recycle possession when they need to change the point of the attack. The other key aspect is the movement and connective play of Hamsik and Lorenzo Insigne in particular. 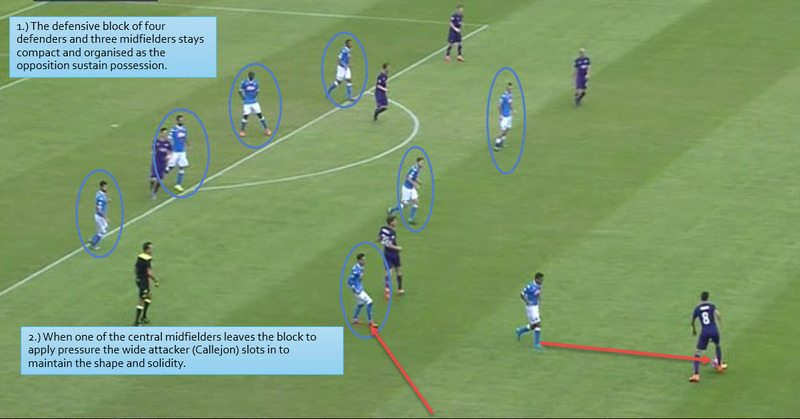 In this image we can see the clear defensive organisation of the team as Fiorentina look to attack. On this occasion, one of the central midfielders has broken the structure to engage the man with the ball but José Callejón has left his position on the right wing to fill in the gap and maintain the structure. Typically, the central midfielder in the middle of the three will be the one that will break the structure to press the ball when the opportunity presents itself, allowing the other two flanking midfielders to close the gap and form a double pivot. Above we have an example of the midfielders supporting the defence fluidly in a pressing movement. The left-back and left central midfielder are immediately engaged by the man in possession for Palermo and by the supporting runs. Hamšík then joins the defensive press as the near-sided midfielder, while the central of the three midfielders arcs around to provide cover and support. 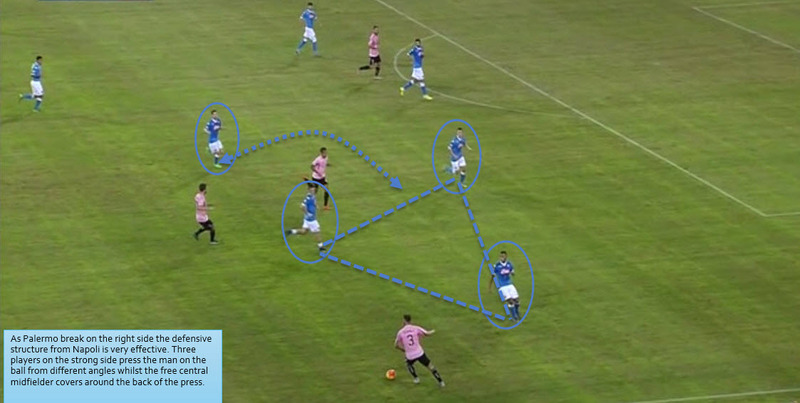 These small movements make it very difficult for Palermo to play through the initial defensive structure and forces them to play the ball back allowing Napoli to settle into a solid defensive shape. This time I have shown the structure of the Napoli team when their first phase of attack breaks down and, as I mentioned earlier, Hamšík has effectively joined the attacking line during the first phase. When Fiorentina try to clear the ball, however, they find that Napoli have organised a double pivot between the nine Fiorentina players in the defensive phase and the one striker they have in an advanced position. This makes it easy for Napoli to retain possession and build into the second phase of their attack. The role of Hamšík for Napoli under Sarri is perhaps the most important in the team. The Slovakian international has remodelled his game in recent years, going from a purely attacking midfielder that would provide a significant goal threat to a more measured presence in the centre of the field, albeit one that still retains his ability to find space around the penalty area. Under Sarri, however, his role has evolved further still to the point that he is now the driving force in the team. When Hamšík takes the ball in deep positions he shows a willingness to drive at the heart of the opposition and to commit players, creating space for teammates. He also links extraordinarily well with Insigne on the left wing and Higuaín in the central striking role. In this image Hamšík takes possession of the ball and drives forward, drawing three opposition players to him as they are aware that they need to counter his attacking threat. This simple act of movement creates space on the left flank for a teammate to drive forward and receive a simple slipped pass that will bypass all three engaged defensive players. This time, against Genoa, Hamšík again takes possession of the ball in the central area and drives forward looking for space. 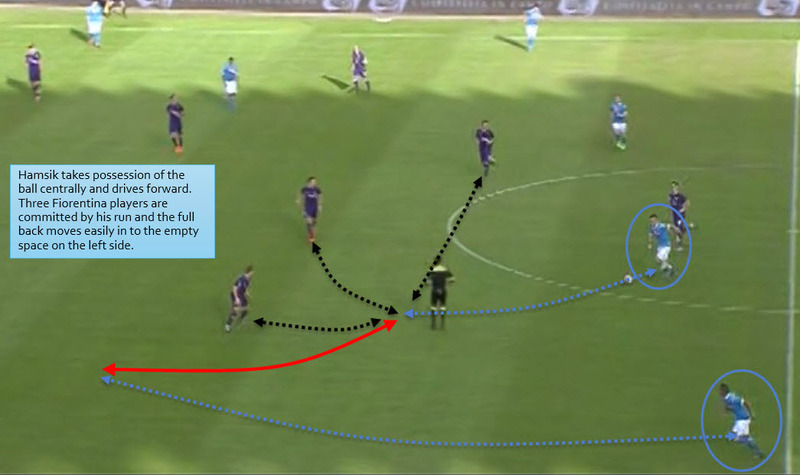 During this movement, Higuaín in the central attacking role sees the run being made and spins into space towards his left, leaving his marker to make the decision to either stick with the striker or step forward and engage Hamšík. 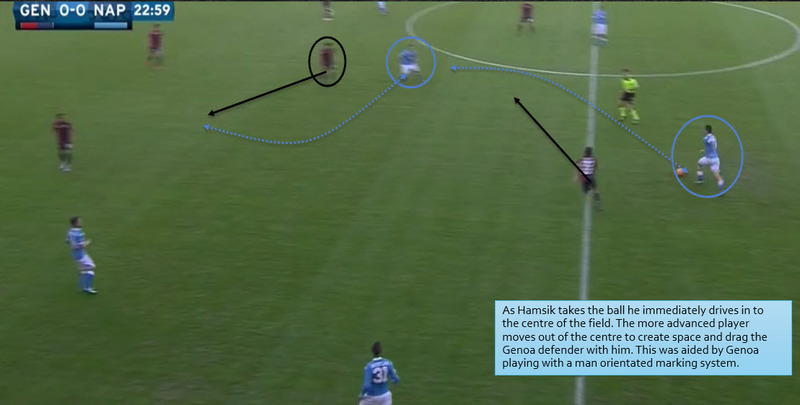 The willingness of Hamšík to take responsibility in possession and drive forward creates a number of problems for opponents in the defensive phase as he forces them to make difficult choices: either create space for others or leave him to drive further forward towards goal. Lorenzo Insigne, like Sarri, is a son of Naples and the fans love him for it. This season has been the first one of real productivity since he made early strides to realising his potential as an attacking force for club and country. He operates primarily on the left flank but, as with Hamšík, he displays good tactical intelligence in knowing when to move infield to occupy the half space and allow his full-back to overlap, and when to hold the wide position to allow a midfielder to support from the middle. Here you can see Hamšík in an advanced central position and the other two central midfielders in a double pivot, with one in possession of the ball. Insigne has moved inside to occupy the half space as illustrated and the full-back has advanced, giving Napoli an overload on the left side. There are three Palermo defenders positioned to counter the threat but they are too deep and too narrow to effect the play when the ball is moved forward to one of the three advanced Napoli players. This shows Insigne’s tactical flexibility and game intelligence in a slightly different light as he has again moved into the central space and effectively vacated the left flank, allowing his full-back to advance. This again forces the opposition defensive player to choose whether to track the run of Insigne or to maintain his position and cover the run being made by the full-back. On this occasion he chooses the tactically safer second option but when Insigne takes possession from a simple forward pass he can spin into the central area and drive at goal. 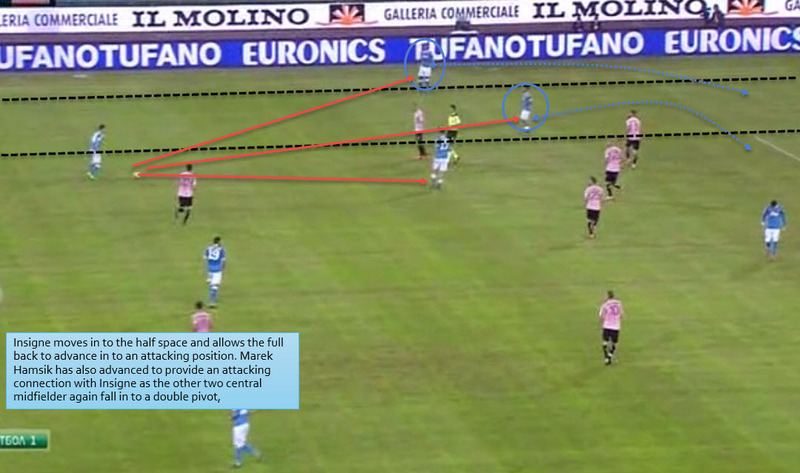 This is a similar example although on the right flank and not involving Insigne. When the player in possession takes control of the ball it is the Spaniard on the right flank, José Callejón, who looks to move into the half space, mirroring the movement that we have already seen from Insigne on the left and further suggesting that this is a mechanised move that has been practiced on the training ground. Again, the full-back acts as a decoy by taking the vacated wide area and, when a simple pass to Callejón takes out five Lazio players, he is able to spin and attack the space behind the Roman midfield with minimal pressure. There is little doubt that so far in the 2015-16 season Serie A is the most interesting league in Europe, not only because there are multiple sides that can challenge for the Scudetto but also because there is a huge amount of tactical innovation currently being shown by sides in the top half of the table. It remains to be seen whether Maurizio Sarri will be the man to take the title back to Naples but there is little doubt that with his tactical knowledge, attention to detail and willingness to improve his players, that the club from Naples have their best chance in years to end the long wait the city has had for another championship.